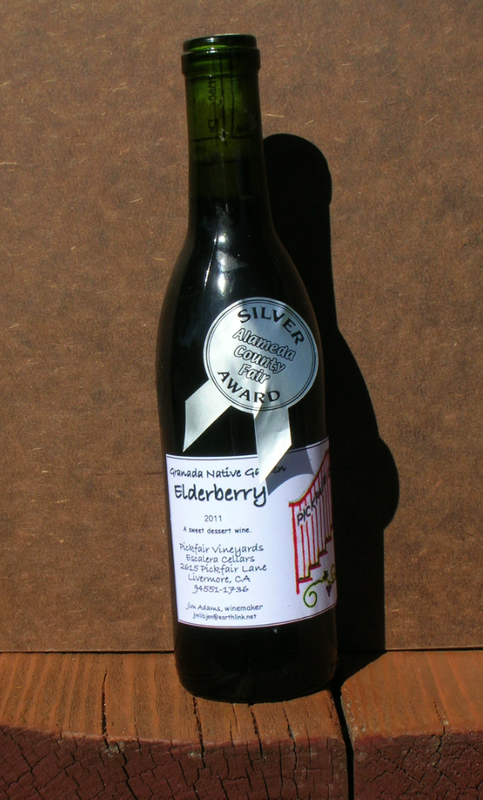 Elderberry – A “Miracle Plant”? If there is such a thing as a “miracle” plant, it must be the elderberry! I know of no other plant that has so many uses – as food, medicines, tools and household goods, even musical instruments. Furthermore, it grows amazingly fast, so that any culture that depends on it for their livelihood is not without it for very long. 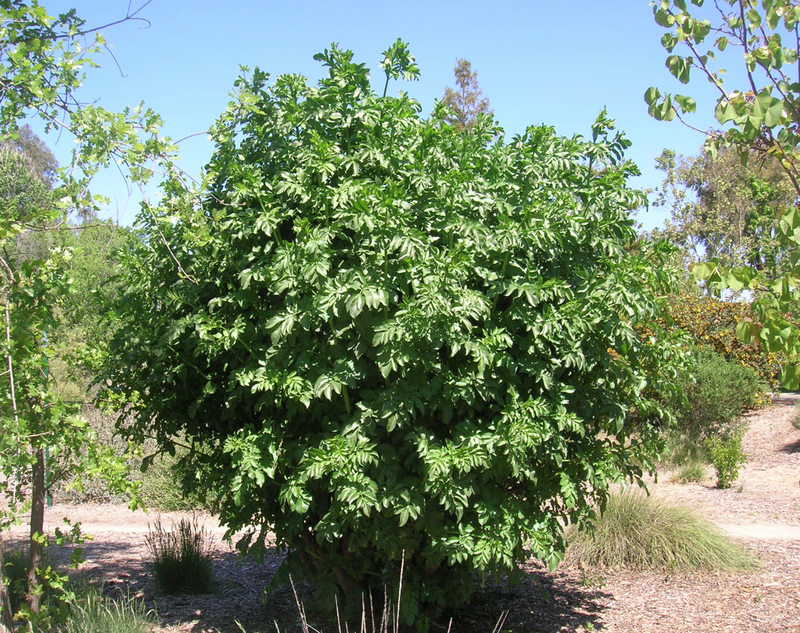 The elderberry (Sambucus mexicana) is a shrub or small tree that can grow to 25 feet tall and just as wide. 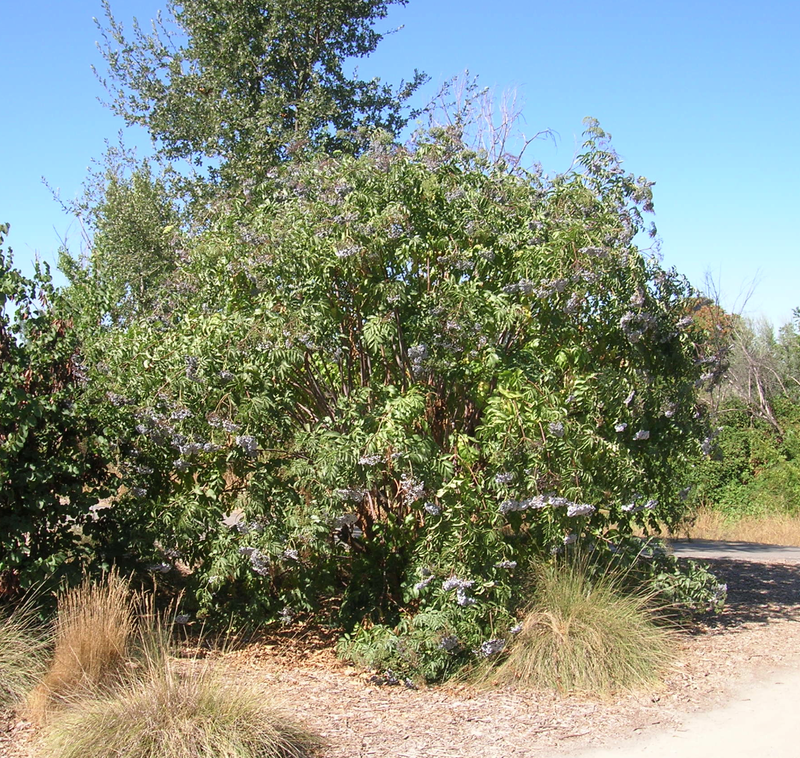 The single specimen at the Granada Native Garden, down at the north end of the Garden adjacent to the bikeway (you can’t miss it when it is in bloom or laden with berries! 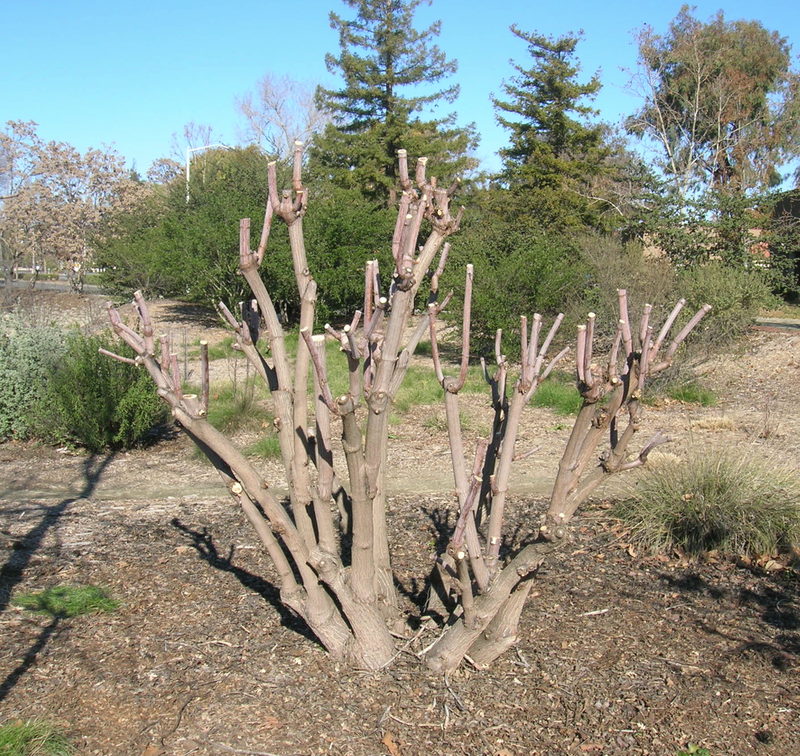 ), is routinely cut back each winter to a denuded skeleton of its yearly growth. Within a month or two, however, it starts to leaf out again, and by late spring it is fully leafed out and beginning to show its large clusters of cream-colored, clove-scented blossoms. Almost immediately after that, the berries begin to form, and by mid-summer the branches are bowing over with heavy, juicy, deep blue berries, usually with a lighter blue waxy coating. 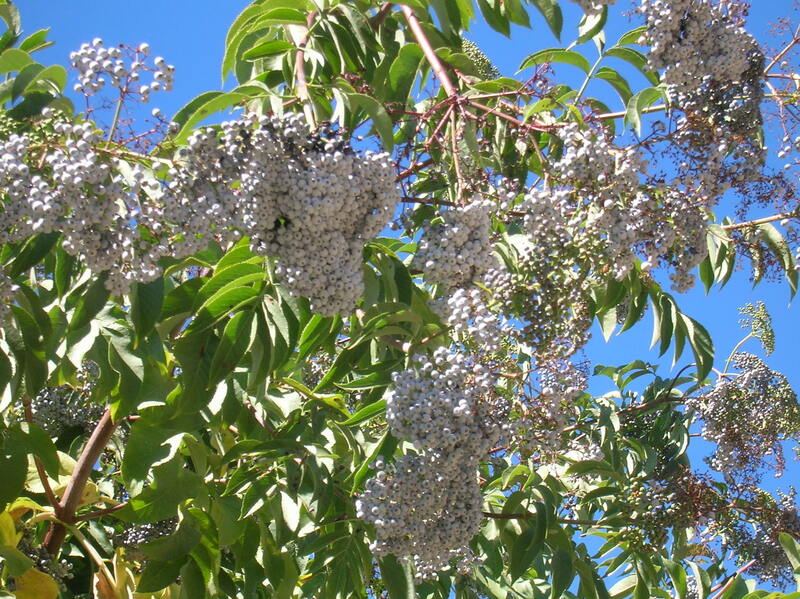 Native Americans Knew Best The archaeologist Paul Schumacher reported that he always found elderberries growing near ancient Native American settlements and gravesites. This is not surprising or coincidental. Native Americans found the elderberry plant – the flowers, berries, leaves, bark and wood – useful in numerous ways (almost too many to list!). Tea made from elder flowers was regarded as useful for reducing fevers and upset stomachs; for mitigating colds, the flu, head- aches, indigestion, twitching eyes, itchy skin, dropsy, rheumatism and the pain of sprains and bruises; to stimulate perspiration and urination, treat inflammation of the appendix and kidney and bladder infections. Poultices made from the flowers was used to treat wounds, improve the complexion, tone and soften the skin, and lighten freckles or spots. Furthermore, the flowers have a pleasant aroma, suggestive of cloves, which can add flavor to pancakes, muffins and cakes. Some people like the flowers dipped in batter, then deep fried and sprinkled with sugar. Science, or Folk Medicine? It is well known that willows contain the same active analgesic ingredient, salicylic acid, as in Aspirin. Native peoples who had no other source of relief for physical dis- comforts, injuries and diseases had to rely on whatever was at hand in their environment to ease their ailments, and many of these naturally-occurring products were, in fact, effective in doing so. This is especially true in the case of elderberry. All parts of the elderberry plant are considered to be a valuable healing plant in many folk medicine traditions, but as early as the beginning of the 20th century, the plant was entered in the U.S. Pharmacopoeia, the official source of established standards for medicines, food ingredients, and dietary products. According to the United States Department of Agriculture Plant Guide, the flowers contain rutin, a strong anti-clotting agent, flavenoids which are known to improve immune function, especially when combined with vitamin C, and tannins which reduce bleeding, diarrhea and congestion. 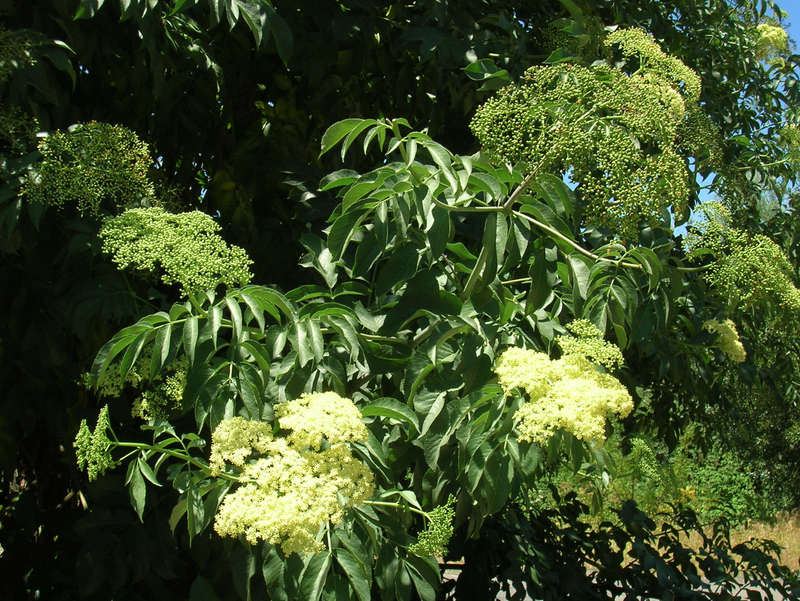 Elderflower tea has been used to treat many of the same ailments described above. The Pomo Indians stopped gathering clams and other shellfish when the elderberries flowered, and started again when the berries were ripe. The berries have one of the richest sources of vitamin C, comparable to navel oranges. They also have a high content of vitamin A, calcium, phosphorus and iron. Medicinally, they are said to act as a purgative and diuretic, to help with arthritis and rheumatism, and to ease the pain of burns and scalds. Native Americans dried large quantities of the berries for use during the winter; they used the juice as a dye in basketry. But currently the most popular use for the berries is probably in making jams, jellies, syrup (said to resemble boysenberry), pies and wine! Even the leaves, bark and roots had uses for the Native Americans. Made into a poultice, and mixed with chamomile, these plant parts were used to reduce the swelling of bee stings as well as for soreness, inflammations and stiff joints. The wood was an important basketry material, and was also fashioned into flutes, whistles, ceremonial clapper sticks, fire drills, bows and arrow shafts, blowguns and popguns, combs, spindles, and pegs. The soft pith from the inside of the branches could be used as tinder for starting fires. 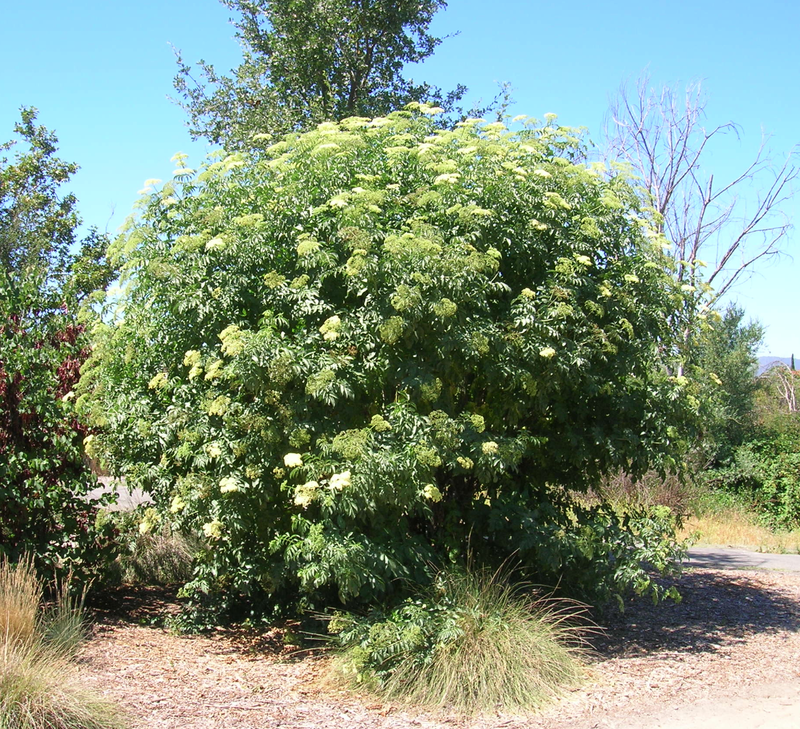 The genus name, Sambucus, happens to be taken from the name of an ancient musical instrument, the sambuke or sambuca (which seems, however, to have been a stringed instrument, not a flute). In fact, some Indians referred to the shrub as the Tree of Music. Last but not least, the elderberry is also a wonderful source of food for birds, bees, butterflies, squirrels and chipmunks, bears, deer, elk and moose. Important Elderberry Cautionary Notes! It is important to remember, when gathering elderberries, that the blue elderberries are the only edible variety, and only the berries at that. Red elderberry (Sambucus racemosa), which is also found in the West, contains hydrocyanic acid and sambucine that produce cyanide in the body unless the berries are sufficiently cooked. 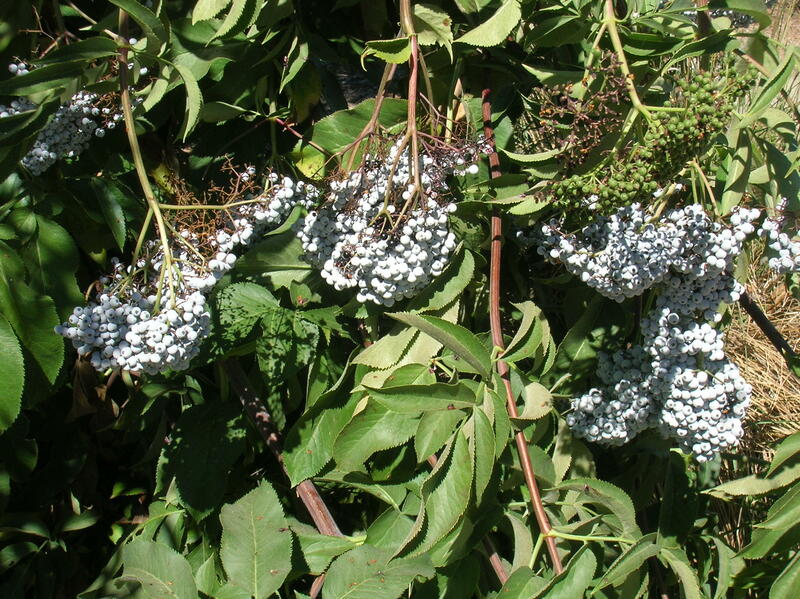 Even the stems, roots and leaves of the blue elderberry (such as S. mexicana) are considered poisonous and can cause nausea or worse or produce severe purging. Don’t consume red elderberries in any form! intheraw.blogspot.com/2010/08/elderberry-peoples-medicine- chest.html, August 20, 2010. 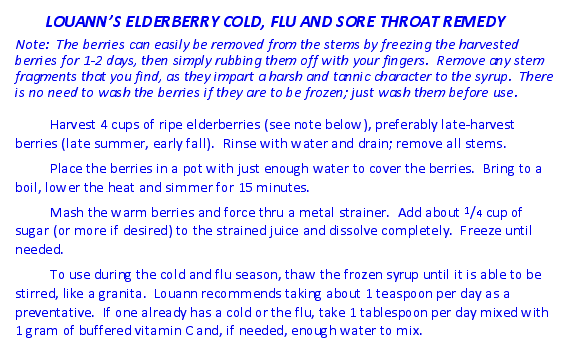 Thanks for this information about the Elderberry tree.